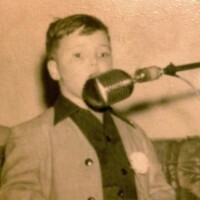 A cute me singing, not punching, at 5. I guess I was blessed — or cursed — with the ability to see the big picture. I can argue fiercely because getting argued back at doesn’t hurt. But I never lose the ability to understand the other’s point of view. I have a lot of trouble with people who put more energy into making the other person wrong than making themselves right. And, of course, when people demonize Republicans, or Democrats, or Christians, or “the media,” or people who wear turbans, it makes me so mad I’d want to punch them in the face if I wasn’t afraid of getting punched back (and if I wasn’t a Buddhist). In the video above, I tell the story of how I went from a ’60s radical to an oil-company public relations executive in the ’70s, and how that led my wife to compare me with the Dustin Hoffman character in the film Little Big Man. He might not have always liked everything in both worlds (white and Indian in the Old West), but he knew how to get along in either. I’m thinking about that today because I’ve noticed how many Facebook posts are about what’s wrong with the other side. My liberal friends spend much more time finding fault with conservatives than promoting their own ideas, and vice versa. Have we lost the ability to listen to each other?